This product is no longer available. You can find similar item here. 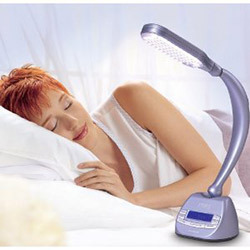 NatureBright PER3 Deluxe 3-in-1 SAD Lamp functions both as SAD light box and a regular lamp with daily alarm clock. With an attractive design, it suits your busy life as it relieves Seasonal Affective Disorder (SAD) and combats stress associated with your modern and hectic schedules. NatureBright PER3 has a swivel arm and pivoting head so you can adjust the direction of the light.